The Wilderness Systems Kayak Konsole has become an immediate classic. New hinged hatch with built in cam levers creates a dry seal. Simply flick the recessed levers and the hatch pivots open on a stout hinge, providing easy unhindered access to contents. The lid stays attached to the Konsole, no needing one hand for the hatch cover and the other for everything else. To close, flip hatch lid down and flick the cams to closed position. Universal cup holders accommodate everything from travel mugs to 32 oz bottles. Recessed mounting surfaces for rod holder mounts and a mesh pocket conclude the generous list of features. Will fit most recreational kayak cockpits and secures via bungee cord under the rim coaming. The hatch is touted as one of the great features on the Pungo. After using it for a couple of months, I would say it has some drawbacks. First the good - it acts as a good splash guard, it does give you some places to put things and the little net bag is handy. Now the bad - the cupholders are virtually useless for anything larger than a to-go cup of coffee. They are not deep enough to support a small thermos. The result is that the thermos falls off or gets in the way when paddling. The dry hatch is only dry in the title. Certainly don't trust anything to stay dry in it - it won't. Ours was also very hard to open or close to the point of not being able to open or close. I never use the two place to put things in because they are of an awkward size and of course, everything will get wet. Overall, a great idea but I'm surprised it isn't more useful. I use it mostly as a splash guard and a granola bar holder. I have the WS Pungo120 and the Kayak Console. The issues I have with it are the sharp edges and the size. I constantly scrape my shins getting in and out of the kayak. But this spring when kayaking a fast moving river I got caught and flipped the kayak on a downed tree in rushing waters. The console basically filleted my shin! Nothing worse then river water in an open wound!! Anyway I have epoxied rubber tubing to the console and it has helped. Great addon to an older Pungo120. Wilderness Systems Kayak Console is one-of-a-kind. It does what it is supposed to do. However, I must add that the console is designed in a way that it can come off very easy. This is good and bad. In a roll, it will come off unless it is secured very well... Hence the reason I am buying this replacement. I like the konsole on my Pungo 140, very convenient. However, the downward plastic edges to the left and right of the front pouch is too low. I scrap my shins when ever I get my legs in. I'm 6'2". I plan to cut them back a bit and add a small section of split rubber tubing to each side to smooth out the sharp edges. Also, the top hatch does not seal very well. Always wet inside. I used Armor-All on. the gaskets, helped. Can be taken on/off easily. I'm using this on my Pungo 120 and love it. It provides a useful deck and forward storage compartment for my phone/keys, etc. Love it! Received my order promptly and in excellent condition. Will definitely order from this company again! 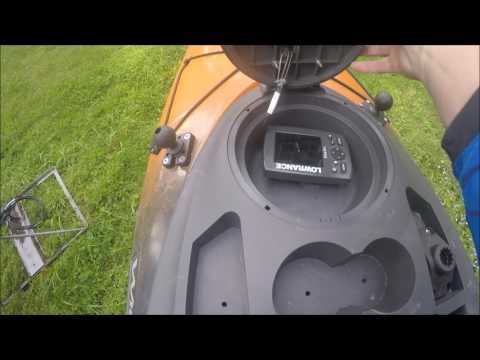 Wilderness Systems Kayak Konsole with Dry Hatch: This unit is really great! Very handy for quick gear item access and keeps the "splash" off in cold wx 'yaking. It fit my Pungo 120 perfectly. For my wife's Pungo 100, the hatch covers part of the cockpit gunwale padding, so I radiused the panel corners a little bit to keep it from wearing the pads. Easy to trim...file, utility knife, etc. The kayak console was exactly what I wanted and it came as expected with no problems or difficulties or surprises. Works well for its intended use, though I had to trim and round the bottom rear edge to keep from scraping my knees when getting into or out of the cockpit. The cockpit cover does not fit nicely with the Konsole installed, so I have to remove it before putting the cover on. I saw this on a kayak paddle and thought instantly, this would be so cool. I bought two that afternoon. Its a great idea but the design has some flaws. First, I had to cut the front lip off mine entirely because it dug into my shins. The cup holders are rather shallow so they don't hold a waterbottle all that well. I put a foam "cozy" on the bottle and that helped. I love the dry hatch and if nothing else this is a reason to buy. The other two areas of the Konsole are odd shaped and not really sure what you'd put there. If you were a fisherman maybe lures but for a recreational kayaker they are incidental. The little mesh bag holds power bars just fine. My wife likes hers; I could go either way. We have two Pungo 120 ULs and these consoles fit them perfectly. I was able to drill the small holes I needed to RAM mount my Garmin GPSMAP 64s in one of the recessed mounting surfaces with no problems. The cup holders are a bit shallow and water bottles tend to tip over. I found that if I put a koozie on my bottles they stay in place. Very happy with this purchase. This is the most amazing accessory for kayak's. Old or new kayak's I would highly recommend adding this accessory. I love this! I bought them for my two Prodigy 10s and it fits perfectly and adds just the right amount of storage space. This site has the best price as well. Great product. Dry hatch and other places to put gear really helps on longer kayak trips. Stays securely in place and remains on kayak, even during wet exit practices. Useful! Hods my coffee or water bottle, fish hooks, etc. I do put my cell phone in the hatch, but only after first putting it into a water tight bag, because this hatch is NOT water tight. Also, I often scrape my shins on the sharp edges when I get out. Solid construction - fits a Pungo 120 very well. The water-proof hatch is very difficult to close and open; I tried a bit of grease to ease the closure/opening - did not make much of a difference. If the hatch loosens-up during use, I would rate a five. If not, a solid four and I will likely just leave the O-ring out. Fits perfect. Even was able to bolt it on with the side screw holes for that perfect factory added look. Great seal regarding the hatch as well. I got this as an early christmas present for my self. I installed it onto a Field and Stream Eaglerun sit in kayak. I had to cut the OE cup holder area (which was useless) and i used a small electric handsaw and files to smooth out edges. I tried it out this weekend and I am very happy with it. I was able to keep my drinks right in front of me with out having it roll aroung the inside of my kayak. The little baf up front was perfect for my favorite fishing plastics. I added a Hobie mount, extention, and rod holder to the right compartment, I had it moutned behind me but it is much better now mounted in front. I also attached my fishfinder screen to the left compartment. So far I have outfitted my kayak with accesories all bought at his site. I have been really happy with all products and the prices are the best. Had to make it fit with a bit of cutting with a dremel tool. We use this on our Wilderness Systems Pungo 100. It works great. Water tight and extra kayaking storage. Although I bought this, I have not had a chance to place it on my kayak or use my kayak at this point. That will happen this summer. I purchased this for my Wilderness Pungo. Fits and I love it. This is a really nice dashboard, but it doesnt fit a Perception Tribute. No matter how bad you try... I sure wish it did! I love this product. I love it so much that I bought another one after I accidentally snapped off the dry hatch when I flipped my kayak over to clean it. Then, within weeks, I had done the same thing to the new one. The hatch is secured with metal L-shaped pins that connect the lid to the body of the plastic console. I had the lid closed the second time, but not locked. The plastic gives way upon impact. duh I have been told I cannot purchase just the replacement hatch, so I now have two perfectly good consoles that have no dry hatches. Not quite the same enjoyment. Much sadness. I am apparently too dumb to own this product. Fit nicely. Installed easily. Adds a nice addition to the kayak. Konsole works well for stowing camera,cell,and wallet in the waterproof hatch. Other spaces keep fishing gear and drink containers stable and within reach.Its easy to install/remove. A negative is that the Konsole reduces the cockpit space and makes exiting my Pungo 120 more difficult. More limber, or smaller, kayakers probably would not have this problem. As noted by a previous reviewer, this product doesn't fit the WS Pamlico perfectly. I modified mine in much the same way as the previous reviewer, but also utilized two sets of paddle straps (with the bungee cord and hooks) to secure it. This has worked well and keeps me from accidentally lifting the console and having it snap towards my face, due to the bungee cord securing it under the coming of my boat. The draft hatch is very snug and watertight, the two cupholder sizes work well for just about anything, the mesh front pocket holds plenty, and the side wells are perfect for a Scotty rod holder mount. Product is everything that the description speaks of. Good quality, well made very happy. Didn't fit my 12' Pamlico really well, so I had to modify the console to fit more securely, trimming off some of the plastic, enlarging the coming openings. Now it fits great. I added a Scotty raised rod holder, so its great as a fishing console. The large cup holder even fits a 32oz Nalgene. The dry hatch is a very snug fit and can be a little difficult to open one handed, but snug means water-tight so I'm okay with that. All around a great product. Great accessory for my Pungo 120. It keeps my camera close by and dry. Also a good holder for soft drinks or water bottles. Everything you bring along doesn't have to be between your legs now. I love it. A little pricey but definitely cool for the fisherman. You can also use it on any kayak. I take it on my fishing kayak and also on my touring yak. It doesn't interfere with your legs either. Cup holder could be a little larger though. I love it. I use it along with a paddlejack paddle support on a looksa 4 kayak. I fish and tour with it. I also found this site to have the best price. Q: Does the Konsole fit the commander 120 ???? A: No this does not fit the Commander 120, It will fit the Pungo 120. Q: Will this fit an Aquaterra Sea Lion? A: No, this will not fit onto that kayak. Q: Will this work on an older Pungo 120 ultralite? Also can I mount a rod holder to this? A: It should be able to work on your boat, yes! It will also be compatible with a rod holder. Enjoy! Q: Will this console fit the Hurricane Santee 116 sport? They seem to have similarly sized cockpits as the Pungo 120. A: Since we do not carry the Hurricanes, I am not able to give you a definitive answer. The dimensions of this are 19" wide tapering down to 3" wide at the point, and it is 18" long. Hopefully that helps! Q: Will this fit a pungo 140? Q: Would this fit an Old town Vapor 10? Q: Will this fit the Equinox 10.4 kayak? Q: Will this fit and old town otter? Q: Will this fit a Perception Swifty 9.5? A: It will fit, but there will be some side to side slop as the konsole is wider than the cockpit opening. Q: Will this fit a 2004 WS Pamlico 145T? A: This will not fit the 2004 Pamlico 145 T very well. The narrow design of the cockpit isn't ideal. Q: Will this konsole fit on my Wilderness Systems Critter? A: Thanks for your question to ACK! Unfortunately this item will not fit on your Critter. Q: Will this product fit on a future beach 124? A: This should fit your pungo, due to it being a 2003 model it is possible that it will not be compatible. Q: will this fit the perception hook angler 10.5? A: It is possible that it would work on the hook 10.5. This is made specifically for Wilderness Systems so please be advised it is made for this brand more than it is perception. A: Unfortunately this will not fit these kayaks only Wilderness Systems. A: This konsole is specifically designed for Wilderness Systems sit in kayaks. This can not be officially recommended to work with your kayak. You can certainly try it out and let us know your feedback via email! Q: I have the wilderness aspire 105, will this Wilderness Systems Kayak Konsole with Dry Hatch work on the Aspire, and if not is there something that would? A: The konsole with dry hatch should work on your aspire without issues. A: We can not guarantee a direct fit, however with some modifications if needed the konsole could fit. It looks like the sound 10.5 has a recess already as if it would allow for the konsole to fit there. Q: Will this fit my feild and stream 12' eagle run? Picture is grey can i get black? A: This is made specifically for the Wilderness Systems line. I can not guarantee this will fit on your kayak. The Konsole is actually a black that sort of looks like a dark gray. A: This product is designed specifically for the Wilderness Systems line. I can not recommend this product for your kayak but you can certainly give it a shot! Q: Will this fit the Wilderness Systems Tsunami 135 Kayak ? A: This will not fit any of the Tsunami kayaks. Q: Will this fit a Perception Conduit 13? A: this is going to be specifically designed for wilderness systems boats. Q: Will this fit my Aspire 100? Q: Exactly how much does the konsole weigh? Q: Hi, will this fit an Old Town Vapor. This question has been answered already but each answer contradicts the other. I'm just looking for confirmation of it fits or not. Thanks in advance. A: This product is only compatible with Wilderness Systems kayaks. Q: My son has a Pelican Bounty 100 we are outfitting for him to fish with me. Any chance this might work on his boat? We need to get his rod holder closer to him and the bins would help too. Q: Will this console fit the Malibu Sierra 10 kayak? A: Hi thank you for the question! This product is only compatible with wilderness systems kayaks unfortunately. Q: Will it fit on a old town vapor 10 angler? Q: Would this fit my No Limits adventure sit-in kayak? A: No, unfortunately this is specifically designed for Wilderness Systems and Perception Kayaks. Unfortunately, this will likely not fit in that kayak. Q: Will this item fit a Jackson Tupelo 12.5 kayak? Thanks. A: It may be possible, though we aren't able to know for sure as it is made specifically for Confluence kayaks. We could measure it to compare against your cockpit to see if it fits. A: This will not properly fit the Tsunami as the the cockpit is too small to accommodate it and the paddler. Q: Will this item fit on a Wilderness Sytems Pungo 10.0 or a Preception Sport Swifty 9.5? Q: Will this fit my wilderness system pamlico 100? Q: Will this fit Old Town Vapor 10? A: Unfortunately, the shape of the Vapor 10 kayak cockpit is a bit too wide to allow for a correct fit of this item. Q: A follow-up question. Pungo 100 and 120 have cockpit width of 22" which is the same as Dagger Zydeco 9.0. If it fits to Pungo, yhen it should fit to Zydeco. What is your thought? A: On the surface it does appear that this should work, however after further investigation the shape of the cockpit on the Zydeco is incompatible with this console. The nose of the cockpit is simply too wide for this console to fit securely. Q: Will it fit to Dagger Zydeco 9.0 kayak? A: No, this Harmony Konsole is not wide enough for the Dagger Zydeco 9.0 and will not fit properly. Q: Will this fit well on an older Pungo 120 (the one with a rubber rear hatch cover)? Thanks. A: Yes, this will work for your Pungo 120. Q: How well does it fit a 2015 Dagger Axis 12? A: The Harmony Kayak Konsole will fit the cockpit lip of the 2015 Dagger Axis 12 nicely.